If you were young and looking at buying a sportsbike in the early 1990s your choice was limited. This was long before the times of the 0% finance deal or free insurance currently being offered to try and entice younger buyers. In the 1990s you could either go for a fairly dull 600, bite the bullet and fork out a gigantic insurance premium for a large capacity four-stroke superbike, or look at smaller machines. These consisted of the largely forgettable GPz500 or fast, but fragile, two-strokes like the Suzuki RGV250 or Kawasaki’s KR-1S. 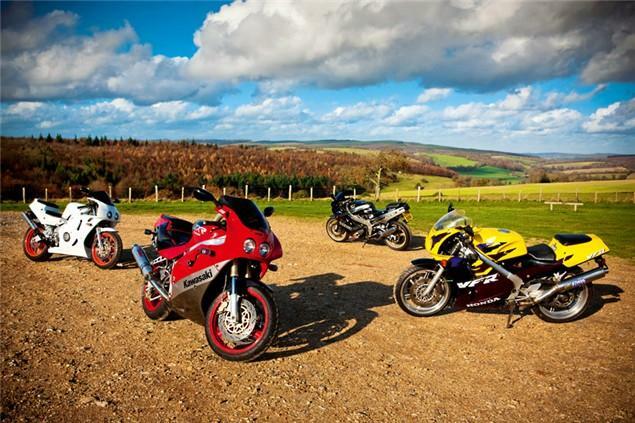 When the idea of gathering four 400cc race reps together was suggested I dismissed it, arguing that with the current crop of secondhand 600cc bikes there was no point in buying a 400 anymore. They were a defunct class – outdated and pointless. But then I started calling some secondhand dealers, asking about 400s and how they were selling. It soon became apparent that the 400cc class is very much alive and kicking, but focus has shifted. Rather than new imports arriving from Japan, the current 400s are the recycled bikes that first appeared on our shores nearly 20 years ago. They’ve been owned, outgrown, and passed onto other riders eager to purchase sportsbikes that aren’t quite as intimidating as 600s but still look the nuts. Decent quality, secondhand 400s are rapidly becoming the choice for new and female riders. They’ve low seat heights, manageable weight and affordable price tags. The class is currently booming.